The rebirth of Virtual Reality in the games industry is blurring the lines between the real world and fantasy, offering an immersive experience which - as time goes on - could become indistinguishable from reality. But that's not the only way that video games and real-life can mix with one another - electronics hacker James Stuart has taken one of Nintendo's best titles and given it the ability to influence external technology. It might make it sound more exciting than it actually is, as Stuart's project merely involves creating a real-world HUD (Heads Up Display, in case you were wondering) for Super Mario 64, which displays the lives, stars and coins in real-time on a set of LED panels. 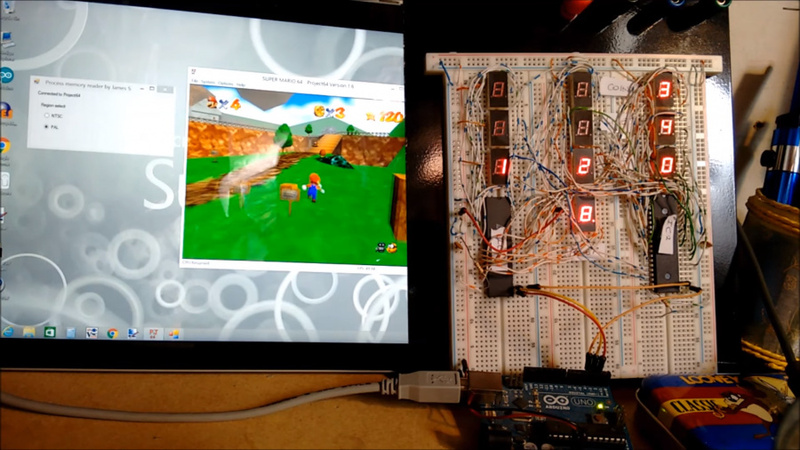 Stuart uses emulation to run the game, and a program he has developed then pulls the relevant data from the emulator using an Arduino. It might seem utterly pointless, but there's a bigger picture here - Stuart's work shows how data from a game can interact or influence other pieces of hardware, and cues from within a game could be used to change things in the real world. An example he gives involves an actual locked door opening after you perform the same action in Super Mario 64. While this might sound like the perfect way to trap yourself in a burning house with no escape route other than finishing a tricky level in the classic N64 platformer, the potential should be clear. What do you think? Is this an exciting experiment or a complete waste of time? Let us know by posting a comment. Hahaha, what's next? An airballoon that explodes when you throw Bowser at a bomb? @GeminiSaint Nine Persons, Nine Hours, Nine Doors. A certain Zero might be interested in this project. Sounds cool to me, you never know sometimes ideas like this take off. Yeah microcontrollers are pretty neat. As a base idea it's neat if he can expand it. Certainly interesting, but an external display for old games seems a little pointless. I guess it'd be cool to have external data that isn't normally displayed, like a map, would be cool. i'm sure if he kept going and streamlined the design you could get some cool things, but, it'd be easier to do work on a game programmed with external transmission intentionally in mind. Sounds like a firm waste of time to me. I dont think you guys are seeing the potential here. You could, hypothetically at least, use this tech to create sophisticated locks that required entering a digital space with an avatar (similar to playing a game) and performing a task without direction, or without making any mistakes. It could be a huge paradigm shift if people saw its potential. It could be the ultimate security feature. Another possible use would be in live gaming events, when players are playing for points, or there is information that would normally appear on screen, you could route that information to a scoreboard without manual entry. Manipulating something in the real world by controlling a counterpart in a safe virtual environment is pointless, stupid and a waste of time? Damn, you guys have no imagination - the possibilities for future applications (in numerous industries) are almost endless. It's a BOMB!!!!!!! Call CTU NOW!!!!! Everyone that says this is stupid and pointless, you have never experimented with something to better yourself? Perhaps James made this because he wondered if he could, and the sense of accomplishment he got from the finished product would be all the reason he needed. I for one am always using my knowledge to test limits and theories if for nothing else than to satisfy a curiosity or polish my skill. Just because you do not understand it does not mean that it is pointless, stupid or wrong. Well I understood most of that, but I really don't really see the point of a device like this (except maybe for speed-runners/Twitch players). Wow, this is really original and exciting! Imagine an electronic device that could operate or control something physical. Like a keypad that accepts a code and then unlocks a door when it's entered properly!! The future is real!! !